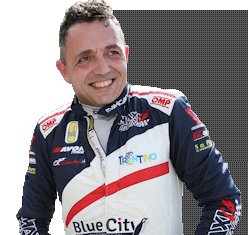 After his victory at Erice, Christian Merli is now in Caltanissetta in Sicily to race his Osella FA 30 Zytek LRM at the 64th Coppa Nissena, the penultimate round of the Italian hill climb championship CIVM, on Sunday. After his European championship win, the Team Blue City Motorsport leader has returned to the fight for the Italian season title, where he has dominated Race 1 at Nevegal as well as the races at Verzegnis, Ascoli, Trento – Bondone, Sarnano and Erice. The final three CIVM races – Erice, Coppa Nissena and Luzzi – each have a point coefficient of 1.5. Merli is currently leading the standings with 120 points, with Magliona only 0.5 points behind. Cubeda is third, at 111. The Coppa Nissena comprises two race heats on a 5.450 km track.